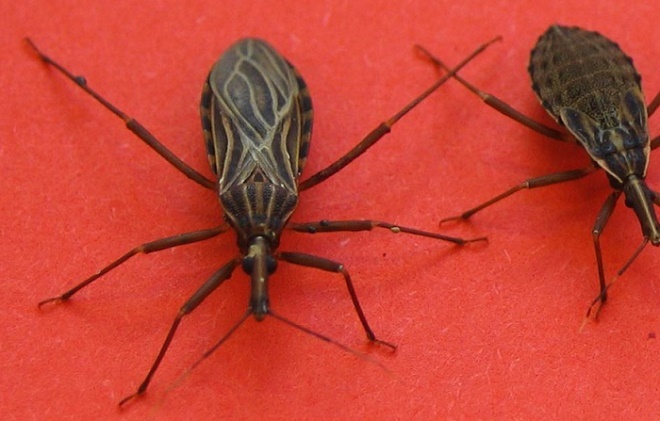 Kissing bugs may sound all sweet and innocent but they're anything but that. The nasty little things are actually parasitic and even deadly in some cases because they spread Chagas disease to both humans and animals. More and more people in South America and the US are increasingly contracting the once rare parasitic infection and it's now estimated that over 300,000 people are currently infected in the US alone. In the state of Texas about 400 dogs have died as a result of Chagas, as dogs are among the most susceptible to the disease. The insect responsible for all of this death and disease, Kissing bugs, are known by their scientific name “Triatomine Bugs.” They operate by biting sleeping people and animals around the eyes and mouth areas because they feed on blood. Then, when their feces comes into contact with either the bite area or a mucous membrane like an eye, they pass the parasite known as Trypanosoma Cruzi to their victim. The parasite is spread this way because it lives in the bug's feces and that happens to be the main way in which it enters a host's body. Many of the above symptoms are quite common for other diseases so thankfully there are tests available that can detect Chagas. When the disease is found early enough it can usually be successfully treated and any of its harmful side-effects lessened. If you keep your house and yard clean and in line with the above points you can greatly reduce the risk of exposure to pets and yourself. Check out the video for more information on the disease and to hear Kiska's story. She's a sweet dog living in Texas who almost died after contracting Chagas. For Kiska it was almost too late, there's no cure for her since her disease was detected when it was in the later stages, and so now she has to live with a pacemaker. Please share her story and pass this important information on to your friends and family. If more people are aware of it, more lives and animals can be saved, or at the very least improved.